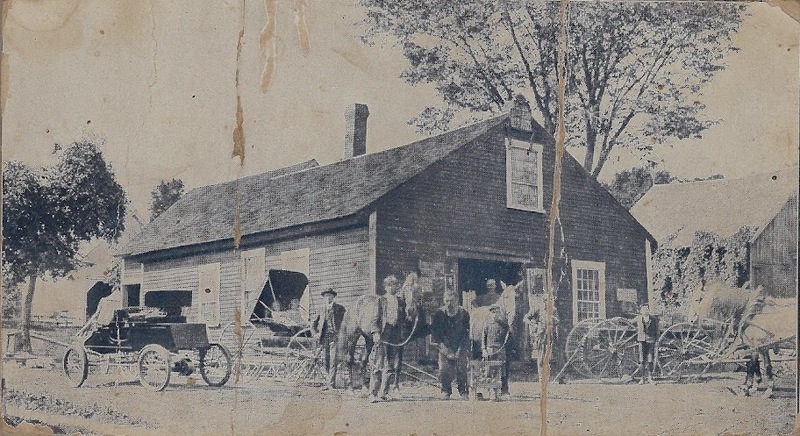 ← Annual Meeting, April 10, 3:00 p.m.
Ned Pettengill's little red car, the first in Danville, sits in front of the Badger blacksmith shop on what is now Route 2. Ancient Roads. When I first heard of their existence, I had visions of a mythical highway hidden under the soil and stones in some corners of the Republic of Vermont. Soon I learned it was a matter of old, faded charts and the recollections of long-time residents. But even the maps and memories get fuzzy with the passage of time. The roads become ruts, the ruts get filled in, and the road becomes not an obscure ramble through the forest. Yet the documents at the Danville Historical Society set me on a clear path where I met the image of the first car and first car owner in Danville–the recently married 24-year-old owner of a red touring automobile, Ned Pettengill. But first, let’s review a bit of history of the automobile in Vermont. In 1898, the first one-seat Stanley Steamer car in the state was purchased by Dr. J. H. Lindsey of Burlington. The practical Steamer was purchased for about $900.00. There were no gas pumps to be seen. The second car was a Haynes-Apperson bought by Charles C. Warren of Waterbury a year later. By 1903 roads, such as they existed, were unmarked dirt tracks which turned to frozen ruts in the winter, became swamps in mud season and bone-dry, dusty ruts in summer. Nonetheless, in that year an intrepid Vermonter, Dr. Horatio Nelson Jackson of Burlington, accepted a $50.00 bet and drove across the continental United States from San Francisco in a two cylinder Winton accompanied by a mechanic named Crocker and a dog named Bud. It took 65 days. (See the Ken Burns film Horatio’s Drive). The legislature passed Vermont’s first registration law in 1904. It provided that all vehicles had to be registered by May 1, 1905. Soon after, the state was issuing white on blue enameled iron plates bearing the words “Vermont Automobile Register” and the number given by the Vermont Secretary of State. The laws of 1905 provided more uniformity and the registration fee was to be based on the horsepower. The excitement in the Northeast Kingdom must have been as great by the advent of the gas-powered car as it was for rural electrification several decades later. The car could now transport a person many miles to see a relative, go to town, see the doctor (or to see the patient) in hours instead of days. Not to mention the macho image of a single male cruising (albeit bumping along on the rutted road) in front of the girls! In 1906, 24-year-old Ned M. Pettengill of Danville, a tall, handsome, man received Vermont registration No. 667 for a 1903 T. B. Jeffreys Touring Car, 16 horsepower, makers No. 1-344 sporting a bright red color. The car made in that year was steered not with a wheel but a tiller (they reverted to the wheel in 1905). It was the second highest in production vehicle in the United States that year after the Olds. There were only 373 cars registered in Vermont the year before, and the State, I learned, maintains no comprehensive registration records dating back to 1906. No research revealed any newer owners in Danville, unless there was an unregistered car in town. Therefore, Ned seems to be first car owner in town. This was confirmed by Conrad Hughson of Putney, Vermont, who has accumulated a listing book for Vermont showing each plate number, to whom it was issued and where. In the Pettengill papers, are a plethora of mailings to Ned from the emerging Motor Age Magazine offering subscriptions, insurance and do-it-yourself automobile books to demystify the air-cooled motor and the “practical” gas engine. No diary entries from Ned exist showing that he took advantage of these books and pamphlets but letters and other records show that he had married Martha Stocker on October 8, 1903, and had two children Esther and Edmund. He then moved to Boston where he was a streetcar conductor and later to Fitchburg, Massachusetts, where he worked on the railroad. Eventually, he became an engineer. His early car purchase and his life’s path show a love of wheels, engines and cylinders. His journey may have been bumpy, but it was individual and unique. We salute Ned Pettengill in his bright red Rambler, riding his way into Danville history. To view a photo album that includes Ned’s registration and driver’s license click here. For a YouTube video of a car just like Ned’s click here. This article was first published in the April, 2011, issue of the North Star Monthly. This entry was posted in Danville Green, From the archives and tagged auto, danville, pettengill, rambler, vermont. Bookmark the permalink. I loved the part about the macho male driving on bumpy roads! Times have not changed so much!